Our seniors had no game last Friday evening but were away to Teconnaught the previous Tuesday. Winning the toss the Teconnaught elected to play with the strong wind towards the river end. With a very defensive set up Teconnaught soaked up early ‘Fin pressure to counter and this set the trait for the rest of the half. Only for some wayward shooting their five point lead at the interval could have been doubled. Both sides saw a player black carded, while the Fin also lost their half forward Ciaran Rice to injury moments before the short whistle. Rory Murphy came on for Rice while Jack Matthews replaced Fitzsimmons. James Brannigan got the only point of the half for the Fin. Half time Teconnaught 0-6 Aughlisnafin 0-1. In the second half Teconnaught extended their lead to seven points while the ‘Fin missed three scoreable frees in succession. A great point from Eoin Lundy doubled the Fin’s meagre tally for 42 minutes of football. An opportune goal for Teconnaught gave them a ten point lead and the game was running away from the Fin with fifteen minutes remaining. Both teams hit two points each with Shane Mooney and Sean Willoughby sending over excellent scores from play. Both Teconnaught scores from close in frees. Oran Flanagan registered his first point of the game from a 13 metre free and a late rally saw the Fin add a goal from Lundy and a second point from Mooney. Lundy scoring from the penalty spot after Brannigan was fouled. With five points separating the side the home side held firm for a deserved win on balance of play. Final score Teconnaught 1-11 Aughlisnafin 1-6. Aughlisnafin: F Murphy, P McClean, Patrick Flanagan, M Murdock, R Quinn, E Lundy (1-1, 1 pen), S Willoughby (0-1), S Fitzsimmons, S McCann, O Flanagan (0-1, 1f), Paul Flanagan, C Rice, S Mooney (0-2), C Croskery, J Brannigan (0-1); Subs: J Matthews, R Murphy, B Willoughby, M Willoughby, A Lawless. This one can be just chalked down to ‘a bad night at the office’ for the ‘Fin against a team who are now outright favourites to win the league and a strong shout for the Junior Championship as well. The ‘Fin remain second in the table at the hallway stage with the reverse fixtures about to begin. Match ball sponsor Elite Plumbing & Heating. Next game is away to Aghaderg this Friday. Our senior player and U14 manager, Ciaran Rice, suffered a serious knee injury in the game against Teconnaught and on behalf of the club we send Ciaran our very best wishes on his recovery. Our seniors were drawn against Ballykinlar in the preliminary round of the Junior Championship. The victors will meet the winners of St Michaels v Mitchels in the quarter finals. The championship is expected to start early August. Baile and Locha minors will play RGU at home this Tuesday at 7.30 pm and are away to Bryansford next Tuesday at 7.30 pm. Marc Quinn 6-10, Marty Og Flanagan 2-2, Reece Tweedie 2-0, Ethan Murray 1-2, Conor Walsh 1-1, Niall Dornan 1-0, Dualta Pickering 0-2. Next match is away to Ardglass. Well done to Marc Quinn who played for the Down ETS U14 footballers last Saturday in an Ulster Blitz in Tyrone winning five and drawing one of the six games played. 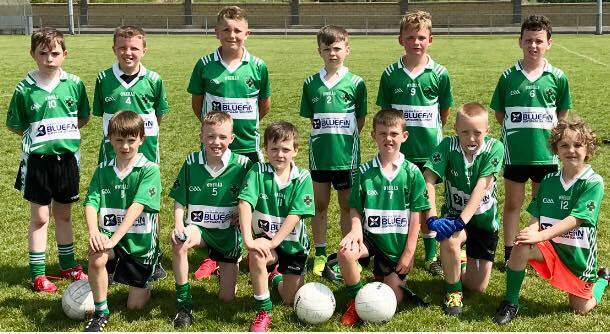 Our U12’s will play Bright this Sunday at 11 am at Pairc Baile Anna. Despite a very young team they are third in the league table and have been superb in every game played to date. Our Year 6’s were at the Go Games blitz hosted by Liatroim on Saturday morning. 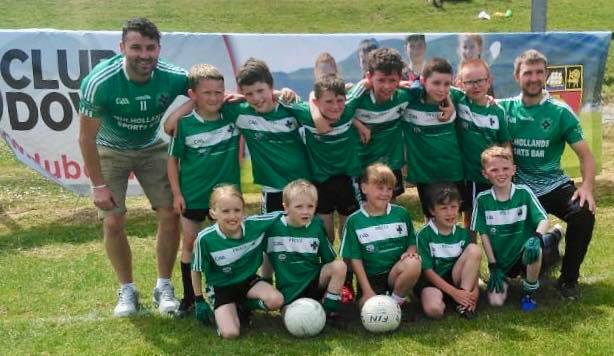 They were superb over four games against Loughinisland, Dromara, Kilcoo and Drumaness with plenty of scores taken and very few conceded. Every player was rotated through the various positions and they enjoyed the run out immensely. Thanks to Liatroim for hosting and for the welcome refreshments afterwards. Team: S Croskery (1-1), R Quinn (2-2), J Lenaghan, R Croskery (1-1), O Murray (0-1), C OHare (4-5), C Flanagan (5-5), D Steen (0-4), M Murphy (1-0), D Steele (8-3), S Boden Hall, D Brennan. Our Year 4s did very well at the Club Down Super Blitz at RGU Downpatrick on Saturday. Unbeaten in the group stages they finished second in their section with a win and two draws and progressed to the Quarter final of the Shield but lost out to a stronger St Pauls team. Fantastic effort from all and some only started playing earlier this month. Our annual ‘Fin Fun Mud Run’ event will be held this Saturday from 10.30 am to 3.30 pm and on Sunday from 12 noon to 2.30 pm. You can book via the link on our club’s website www.aughlisnafingac.com or you can pay on the day although we cannot guarantee a preferred time slot. Lotto 3, 4, 8, 14. No Winners. Jackpot now £3,450.